When I think back to around 10 years ago I had no real idea or knowledge of what real Italian pizza actually was. At best I’d order a Pizza Hut as a one-off, had no idea what sourdough, wood-fired or Cornicione (the crust) meant and I was always left feeling dissatisfied and a bit ‘ugh’. Fast forward to now, and through the influence of my boyfriend Steve, I’ve eaten real pizza all around Italy and Europe. I’ve made my own Sourdough pizza at Franca Manco, and I’ve moved on from the classic cheese and tomato flavours to my favourite now being loaded with veg, pesto and sprinkled with some fancy hard cheese I don’t really know how to pronounce properly. 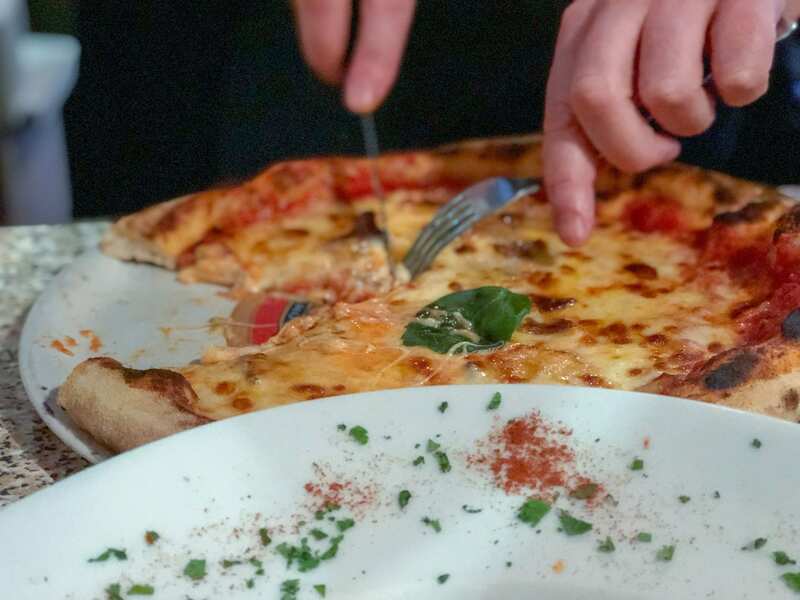 I’ve written about Steve and his love of pizza a few times now, it’s getting a tad out of hand if I’m being totally honest 😉 and I’m not sure how many more Friday’s can be spent eating one. Unless of course we continue to find restaurants like Papa Gee’s, then I’m back in the pizza addiction game with him. Based in Caversham, a 20 minute or so walk from Reading town centre, Papa Gee’s is a real gem of a find. I’ve read about it on Twitter for a year or so now and whilst I kept thinking that we really should give it go, we just never got around to going. Until now. Well, two weekends ago actually, but I’ve been preoccupied with other things since then and it’s taken me a day or so to get organised with my photos and whatnot since. Caversham kind of reminds me of somewhere in York, my hometown, but I couldn’t quite figure out where. It was really bugging me but I’ve just realised its quite similar to the cool end of Bishopthorpe Road (or Bishy road as it’s more commonly known to the locals). A road with a few streets winding off it, close to town, up and coming, but also full of lovely independent shops and restaurants. It definitely has a way to go to be in the same league as Bishy Road, but still, there’s something there, and what with all the exciting food changes in Reading lately, I feel like Caversham has the potential to be some much better. I just wish they could boot Costa out!! What Else is in Caversham? Prospect Street and Church Street are what I’ve assumed are the two main roads for foodie finds in Caversham, but I may be missing something as it’s not somewhere I’m too familiar with yet. I am determined to change that though. Especially as one of my most favourite vegan foodie stands is potentially (fingers crossed) taking premises there soon too. You’ve got Georgian Feast, Kyrenia (another placed raved about on Twitter) and a few other places I’d like to try. I have been to Alto Lounge where I, unfortunately, didn’t have the greatest experience but it was about 3 years ago, and I’d like to think it’s improved since then. In Italy, the best trattorias (Italian cafes/restaurants) are often the ones tucked away, down the side streets of the city you’ve been exploring. The least fancy, most modest looking ones you accidentally stumble across, tend to be the ones you can rely on to serve the most beautiful food. When my brother lived in Florence he took me to some places I’d never have found myself, and I quite often reminisce about the food and drink we had there. I feel like Papa Gee’s fits in with this. Taking a corner spot on Prospect Street with seats and tables in front of the large windows, Papa Gee’s is painted a dark shade of red, has a weird side-door entrance (don’t try the ‘fake’ front door) and on the evening we visited, there was a large table of Italians already eating and a couple of Italians chatting outside too – a very good reassuring start. It’s not showy in any way, it’s definitely modest, it’s clean, the service is friendly, and if the food is good enough, then does anything beyond this really matter? We were seated quickly, the welcome was genuine and warm and we chatted for a little while about the menu and different options whilst both feeling really excited, hungry and intrigued. The decor isn’t fancy, but it suited the vibe, the people were very friendly and gave a lovely ‘family’ feel and the restaurant felt like some cosy little Italian Bistro. You can view the menu yourself right here. I knew Steve would order pizza – obviously. The Quattro Formaggi topped with Mozzarella, Grana Padano, Smoked Provola and Gorgonzola for £10.50 to be exact. As tempting as it was to order a pizza too, I went for the Ricotta and Spinach filled pasta with tomato and basil sauce, topped with Parmesan shavings (£8.50). And a side-order of zucchini fries (£3.50). Our food came very quickly! Something which sometimes would concern me, but everything we ordered was the kind of food that cooks very fast. So it made sense. Simple Italian food cooked well – exactly how it should be! Italian food has always been one of my favourites, it’s never a chore and always a treat. Steve was pretty silent throughout eating his pizza, which is a good sign. He did give me a slice, a little slice mind, but that’s fair enough. I’m not keen on sharing my food either, and he declined to try my pasta – so win, win! 😉 Baked with a lovely thin base and a crispy crust slightly burned around the edges the base was covered in a generous layer of tomato sauce (which Steve added, it was meant to be a white-pizza) and the mozzarella was still bubbling making me seriously envious. But, I shouldn’t have worried about whether I made the right choice as my pasta was cooked amazingly well. The homemade sauce was incredible and I desperately wanted more. Hot, filled generously, and what I thought was a small portion when it first arrived, was actually plenty. I couldn’t praise it enough. The batter on the Zucchini fries was light and crisp and when I’d last eaten these somewhere else the water from the courgette had made the batter soggy (awful word, sorry) – these were totally the opposite. A light sprinkling of sea-salt finished them off perfectly. When it came to dessert I asked our waitress (possibly one of the owners) what was her favourite. She couldn’t decide but narrowed it down to the tart or the tiramisu. I went with the latter and didn’t regret it. With just the right amount of cocoa and coffee it tasted amazing and I could have easily eaten a second slice. Maybe…actually probably! ,We had such a perfect Friday night meal and it set our weekend off to a great start. So much that Steve made my laugh by muttering “thanks Mama Gee” as we left full of food and an intention to return as soon as we could. Thank you Papa Gee’s and Caversham, we will be back soon. "Easy Rolo Rocky Road Recipe"
"Happy Friday | 10 Good Things #1"
Great post Natalie, I am excited to visit!